Combine the best location in Seattle with incredible apartments and first-class amenities, and you’ve found your new home at Dunn Motors. The historic Dunn Motors building has been a fixture in Capitol Hill since 1925. For decades, it housed numerous car dealerships before one of Seattle’s largest printing companies, CK Graphics, took over from 1974 to 2012. Scheduled to open in a few short months, it is now the home of Seattle’s newest luxury apartments. The contemporary remodel has transformed this iconic Seattle landmark into a beautiful 7-story complex that retains much of the look and feel of its past. Location is everything, and the Dunn Motors Apartments are within easy walking distance of the major employment centers in the area, including the growing medical facilities centered around Swedish Hospital, as well as hi-tech center in South Lake Union. Dunn Motors is located in one of the finest neighborhoods in Seattle. Known as one of the most prominent districts for entertainment and nightlife, Capitol Hill is the premier place to live in the heart of the city. 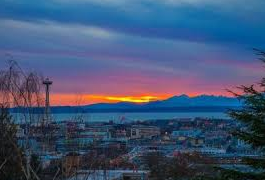 Located a short distance from both downtown and Pike Place market, Capitol Hill is near it all. Step out your front door and head down the street to experience the abundance of cafe’s and boutiques. Or depart from the urban vibe altogether with a short stroll to Cal Anderson Park, which is recognized as one of the nation’s best parks by Forbes.com. Some of Seattle’s highest-rated dining establishments are located nearby, including two on bon appetit’s list of America’s Best New Restaurants. You can find elegant dishes with influences from all over the world within just a few blocks of Dunn Motors. Aside from the nearby dining options, there’s incredible shopping, dramatic nightlife, and lively entertainment found all around our Capitol Hill apartments. Walk to everything! According to walkscore.com, most daily errands don’t require a car when living in Capitol Hill. You’ll live in an energetic community of exceptional people. Those who live in Capitol Hill are relatively young, successful, and seek to enjoy life to the maximum. Living in this neighborhood, you’ll be immersed in the vibrant energy of your surroundings. The famous Pike Place Market is only a short distance away. You’ll be in the center of the action. Indulge in the nightlife, shopping, restaurants and entertainment scene all around you. Capitol Hill is fast becoming one of Seattle’s most desirable neighborhoods. 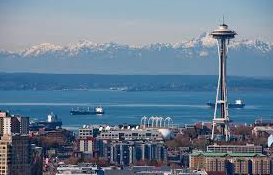 Live around people who enjoy the best that Seattle has to offer. Whether you are young, or just young at heart, you’ll enjoy the vibrant lifestyle that attracts others just like you. In Capitol Hill, you’ll never get bored. Why Live in Dunn Motors Apartments? When you live here, you’re a part of our neighborhood community. We host regular social events to bring people closer together. At Dunn Motors, you’ll be part of a lifestyle you deserve while mingling with other dynamic individuals. Dunn Motors provides all the best amenities available, and offers the ultimate location for luxury apartments in Seattle. You’re close to a fabulous nightlife, exciting entertainment, trendy bars, and world-class restaurants. Live at Dunn Motors and turn your backyard into the city’s playground… and of course secured parking is available for both your car and your bicycle, although you may not need them anymore! 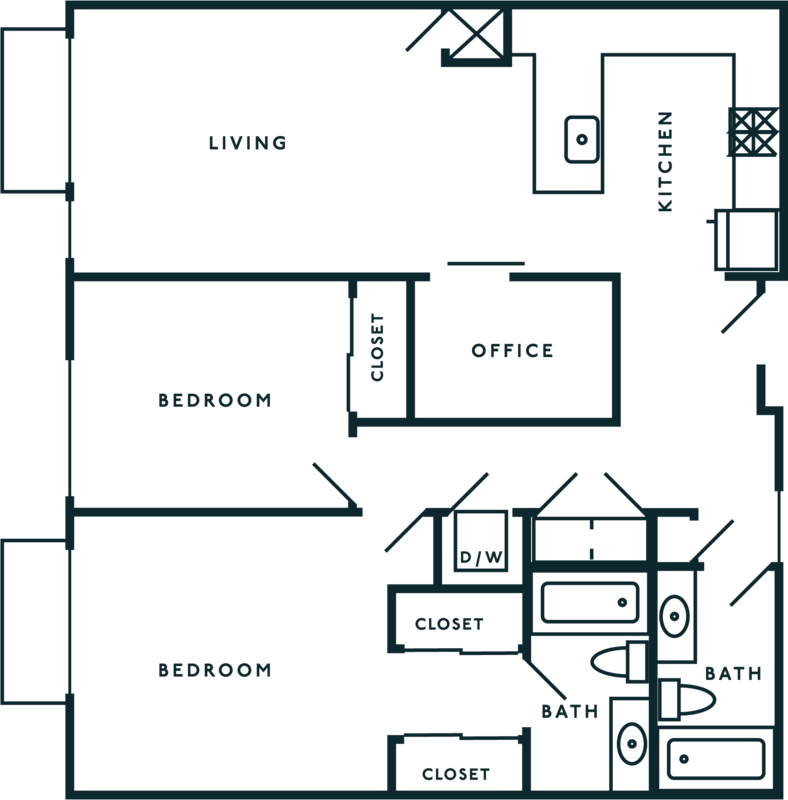 Find your perfect new home within one of our brilliant floor plans. We have a range of designs to cater to your exact needs. All of our apartments come with easy-to-maintain plank flooring, dark rich fur cabinetry, and modern, stainless steel appliances for a lavish living experience. For your convenience, each apartment is furnished with USB outlets and your own washer and dryer. Live simply on the top floor of our building in one of our cozy studios. With modern amenities and spectacular views of the city, simple living has never felt better. 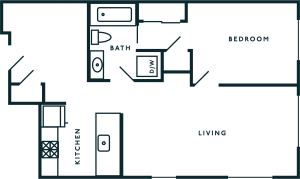 Enjoy the practical and spacious design of our one bedroom apartments. The highly durable plank flooring provides easy maintenance with the look of rich wood grains, with a matching wood sliding partition to separate your living area and bedroom, providing an open design with an option for privacy. Need some extra space in your apartment? The spare den area gives you a number of options to set up a truly extravagant home. Use the bonus room for a home office, guest room, or hobby area. Let your imagination run wild, the options are endless. Perfect for young professionals or couples looking for some added space. With large windows, a breakfast bar, large pantry, abundant counter areas and separate bedrooms you and a roommate will love your new place. 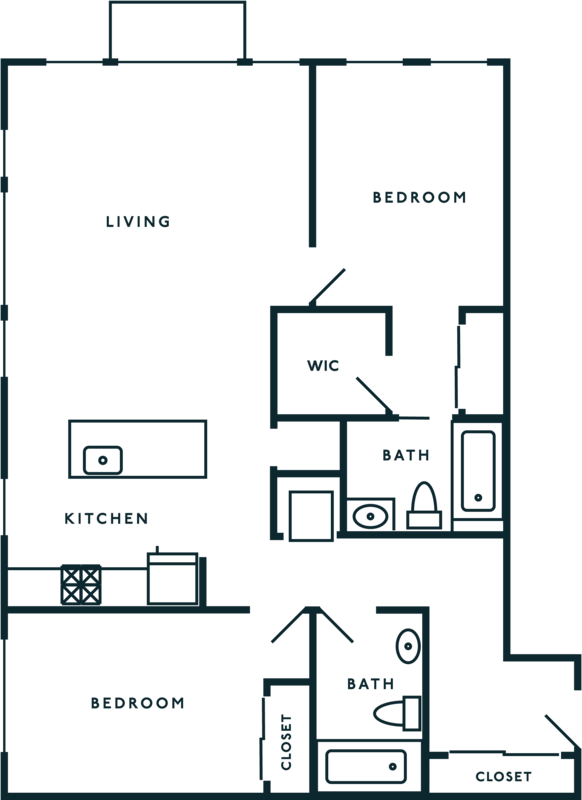 With two bedrooms and an extra den area, your options are open. 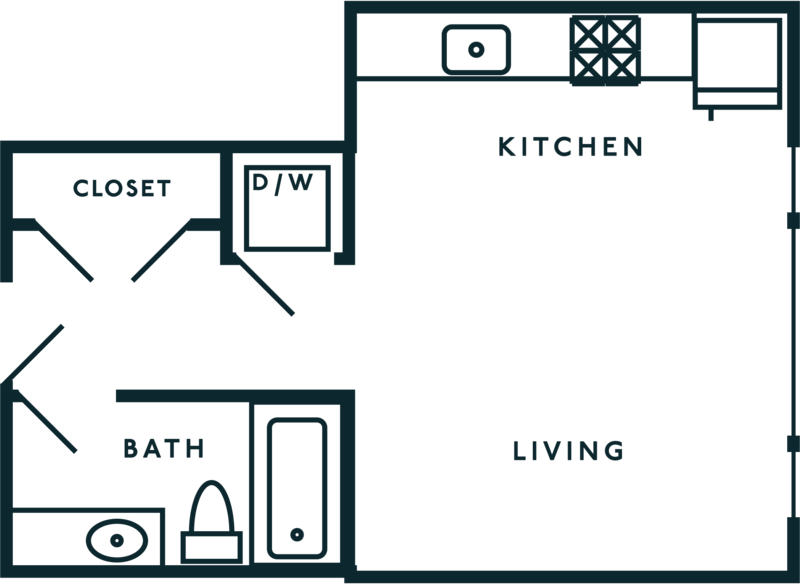 This floor plan is perfect for roommates or families that need some additional space. Turn the spare room into a home office, a playroom, or a place for crafts. Get creative, there’s plenty of space. Enjoy the extravagance of living in the Dunn Motor Building. Our facilities are designed with the ultimate living experience in mind. 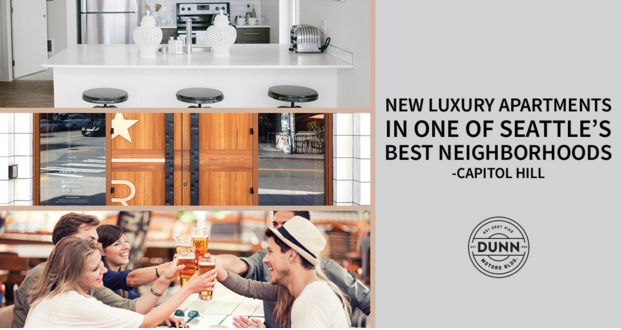 Our desire is to create a neighborhood community and provide access to the best Capitol Hill has to offer. Living in Dunn Motors means you’re reducing your carbon footprint. On our rooftop, we have a 5,400 WATT solar energy system dedicated to generating sustainable power from the sun, helping reduce our energy use and contribute to your lowered electricity bills! Escape the indoors to our impressive rooftop deck. It’s fully equipped and ready for any occasion or social function. Jaw-dropping views of Downtown Seattle, South Lake Union, and North Capitol Hill will take your breath away. With a Sonos music system, two fire pits, BBQ, complimentary WIFI and kitchenette, you’re sure to be a popular host for your next social gathering. Make a bold personal statement by choosing an apartment that brings Seattle’s dynamic skyline right into your new home. Let Seattle’s energy be the first thing you see every morning by choosing a floor plan and apartment that has one of our personal balconies or patios ranging in all sizes (204-1500 sq ft). You’re sure to find a perfect fit! Don’t miss another package again. Our front desk assistants will be available to sign for your deliveries and accept packages from local carriers. If you can’t make it in to pick up your package during office hours, just let us know. With your permission,we’ll be happy to leave it inside your front door. In the morning, take time to stop and savor a cup of coffee in the lobby coffee bar. In a rush, grab one to go, it’s complimentary. Each month we host a resident breakfast in the lobby to give a boost to your day and the Dunn Motors community vibe. Grab a savory morning meal to go or dine-in with your friends and neighbors. Local sponsors host regular happy hour events at Dunn Motors, providing prime opportunities to get to know your neighbors and build community over fantastic drinks and delicious food. Never feel disconnected again! Throughout the common areas, we provide free Wi-Fi for our guests. You’ll always be connected, whether in the lobby or hanging out on the rooftop. Dry cleaning has never been easier or more convenient. Simply bring your clothes down to the leasing office and we’ll take care of the rest. Your garments are in excellent hands. Service is supplied by Blue Sky Cleaners – Seattle’s first toxin-free dry cleaning service. There is no shortage of ways to get in the best shape of your life. Lean 206 is a fitness establishment located in the Dunn Motors building. The program uses interval training and combines cardio workouts with weight training. Residents receive the first two weeks free! If a traditional gym is more your style, Urban Fit is just across the street offering monthly and drop-in rates. During those few summer months that become unbearably hot, you’ll be prepared at Dunn Motors. Every apartment comes with built-in air conditioning ports for easy hook-up. Live in a home you love that’s close to everything. Welcome to Dunn Motors. Experience life in your new Capitol Hill apartment in Seattle’s best neighborhood. Live near Amazon, Pike Place market, Downtown, countless restaurants, cocktail bars, shopping and other entertainment options. Apartments are filling up fast, Apply Now. Call 206-257-1999 for more info.